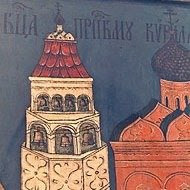 From ancient times church bells were perceived as living beings in Russia. Each of them was given a special name. Before raising a bell up to the chapel it was consecrated, the ritual corresponding to the sacrament of christening. From the times of the Old Rus’ and the epoch of princes the most fateful events in the history of Russian land and church were marked with bell ringing. The sound of bells attending a person throughout the whole life was just as natural for everyone as sunshine or wind blowing. Initially, before the bells appeared in Rus’, the believers were convened to divine service with the help of iron or brass plates (called “klepala”) bent in half-circles and struck with special wooden sticks (called “bila”). It was not before the late 10th century that bells appeared in Russia and became one of the most important instruments of an Orthodox temple. Bell ringing is used to call the faithful to public worship, express the triumph of church and divine service and announce the time of administering the most important rites to those absent from the church at the moment. Russian Orthodox bell ringing considerably differs from the way of ringing typical of other confessions. While Western European peals include melodic and harmonic basis (like that with carillon), Russian ringing has nothing of the kind; it is based on rhythm and character. A bell ringer following his inner flair, feeling for rhythm, using perfect knowledge of scale and performing mastery, as well as basing on prayer and his personal outlook can express joy and peace, deep grief and triumph of spirit with his ringing. Church bell ringing evokes peaceful, joyful and bright spirits in the souls of those looking for unity with God. Thus a person can define one’s state of mind by the impression one is getting from bell ringing. The sound of bells has wonderful power penetrating deeply into people’s hearts. When the Russian people grew fond of church bell ringing they linked it to all their festive and sorrowful events. So, the ringing serves not only to point the time of worship, but also to convey happiness, sadness or glory. Hence is a variety of ringing types, each of them having their own name and meaning. 1) Blagovest is peculiar for measured strikes into one big bell. With this ringing the believers are heralded about the start of divine service in church. Blagovest can be festive, everyday, and for fasting days. 2) Perezvon is running over the bells from biggest to the smallest one or vice versa with various numbers of strikes into every bell. 3) Zvon is the typical rhythmical ringing using all the major groups of the bell scale. This type includes festive (trezvon, dvuzvon) and everyday ringing, as well as compositions made up by the bell-ringer himself and prompted by his creativity and self-expression. Church peals are directly dependant on the status of service, and thus the names of bells correspond to the days of church calendar. Festive bell is the heaviest bell used during great holidays and on special festive occasions. Sunday bell is a smaller one, ringing on Sundays. Polyelaion bell is for days of Polyeleos. Regular bell is for everyday ringing. Fast bell is used during the Lent. Hourly bell chimes before reading of Lenten hours. In addition to the names related to the type of service, bells can have their personal names, such as Broad, Swan, or Ram (probably springing from their peculiar sound timbre), or Korsunsky, Nemchin, or Rostovsky (the names deriving from the bells’ locations). Church bells remain a great spiritual relic and bell ringing traditions are being revived nowadays all around Russia.